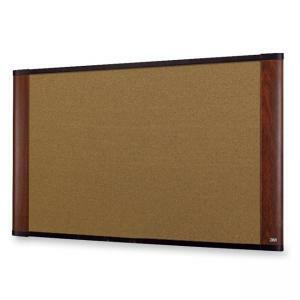 Self-healing cork bulletin board is made with graphite blend cork for a professional appearance. Dense fiberboard backing is sealed to resist warping and reduce moisture absorption. Frame has a wide-screen style and mahogany finish. Install with included mounting brackets and Command Picture Hanging Strips to stabilize the bottom. Frame is securely fastened using screws for durability.